Another new direct flights destination will be available next year to Irish travellers flying from Dublin. Cathay Pacific has announced that starting June 2018, it will have direct flights from Dublin to Hong Kong four times weekly. It will be a year-round service, flying on Mondays, Wednesdays, Thursdays, and Saturdays. In summer, flights will depart Dublin at 11.55 a.m., arriving in Hong Kong at 7.05 a.m. the following day. 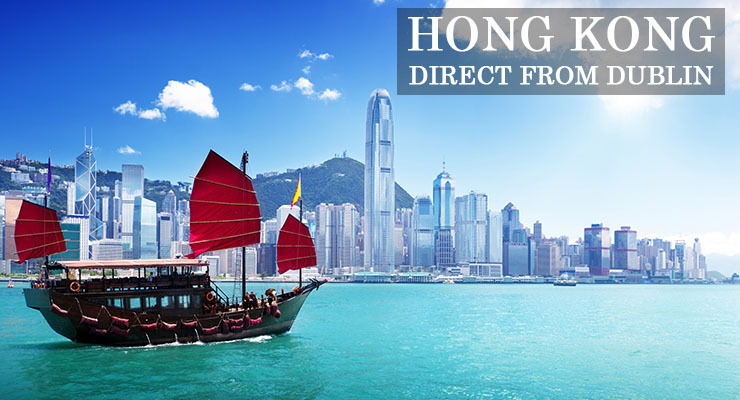 Return flights will depart Hong Kong at 12.50 a.m., arriving in Dublin at 6.45 a.m. In winter, flights will depart Dublin at 11 a.m. and reach their destination at 7.30 a.m. Return flights will depart at 12.15 a.m. and arrive at 5.30 a.m.
Cathay Pacific says an Airbus A35-900 aircraft will service the route. They have not yet given any indication of likely fares, however. The new flights are likely to appeal to business travellers in particular, due to the growing economic links between Ireland and China. Trade between the two countries is currently worth more than €8 billion per annum. Almost 100 Irish firms have operations in China, employing a total of 100,000 people there. However, the flights will also be attractive to tourists who either wish to visit Hong Kong itself or use it as a stopover hub. Cathay Pacific and its budget airline subsidiary, Cathay Dragon, themselves have onward flights from there to several locations in the Far East, as well as Australia and New Zealand. The announcement comes at a time of continued growth for Dublin Airport. More than 16.9 million passengers have travelled through the airport in the first seven months of the year, which is a 6% increase on the same period in 2016. The airport set a new traffic record in July when it welcomed more than three million passengers in a single month for the first time ever. Dublin Airport currently has direct flights to more than 185 destinations in 41 countries operated by a total of 47 airlines. If you’re making travel plans for business or pleasure, to Hong Kong or any other destination, make sure that you and your travelling companion(s) are carrying comprehensive Travel Insurance for the trip.